Disclosure: my trip to Bali was sponsored by Starwood Preferred Guest. My opinions are my own. 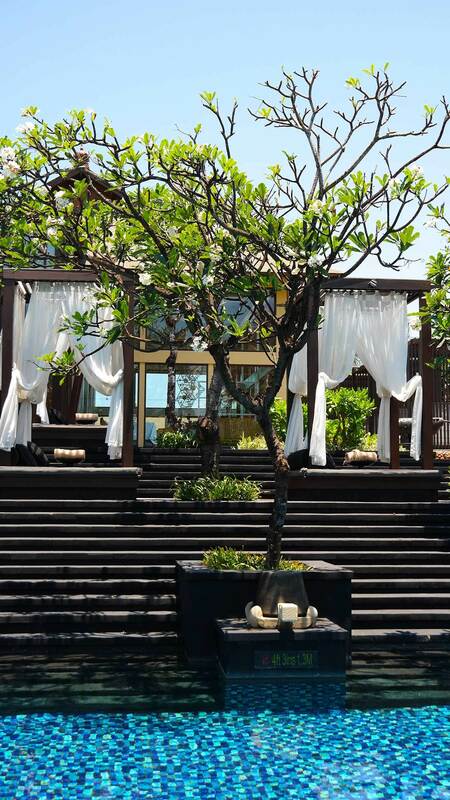 Words fail me describing the St. Regis Bali Resort, it is simply outstanding in every way. Let me take you on a photo tour of the property of your dreams (well, my dreams!). 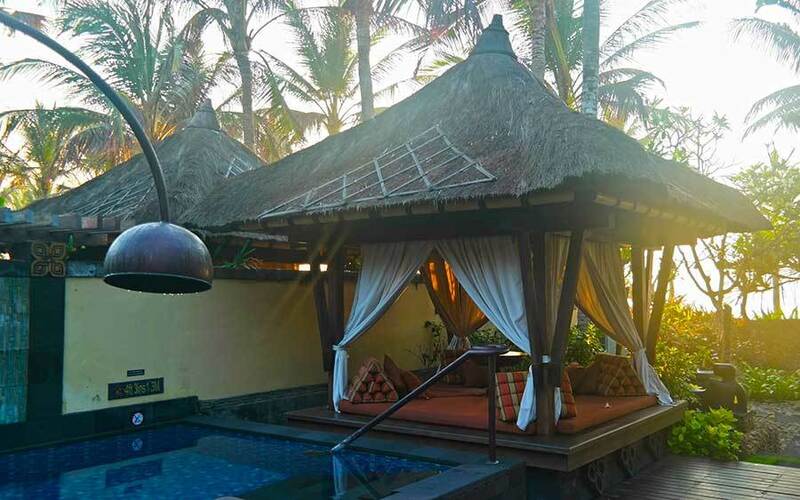 When you are looking for an exotic romantic getaway, I haven’t experienced anything that comes even close to St. Regis Bali, and I highly recommend adding it to your bucket list. 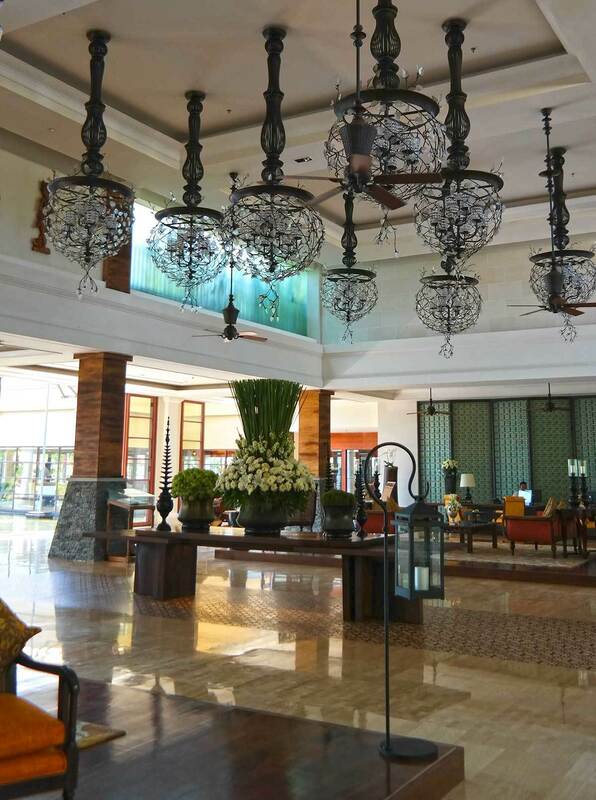 It feels like a breeze of luxury sweeps you in the minute you step into the welcoming reception area of the Starwood Preferred Guest property, The St. Regis Bali Resort in Nusa Dua in Bali, Indonesia. 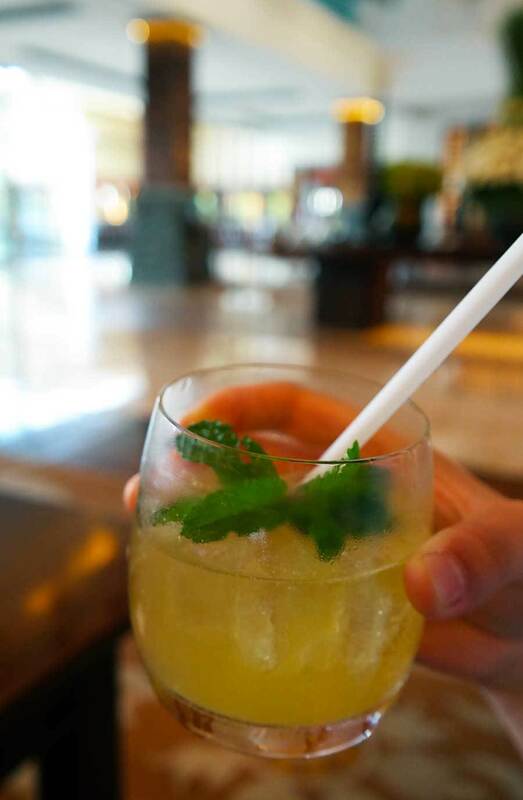 We are greeted with a welcoming smile and a cold welcome drink – what a treat in the tropical heat of Bali. 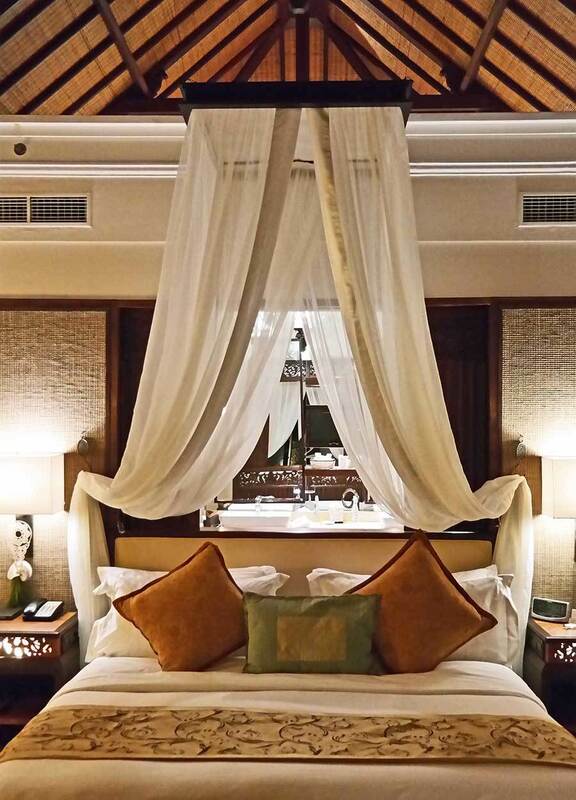 We had already been touring Bali the entire day, and were tired when we arrived, but you can’t help but relax immediately after settling at St. Regis. 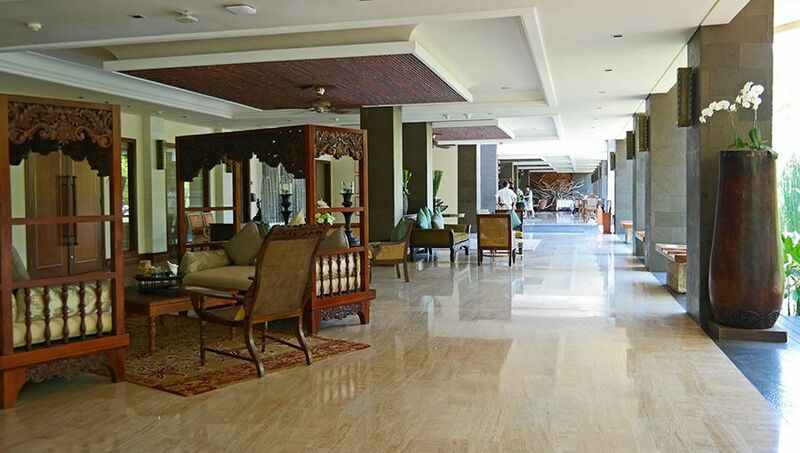 For those who arrive to St. Regis Bali from the Ngurah Rai International Airport in Denpasar, it is only a thirty-minute-drive, and you will have a driver waiting for you at the airport. 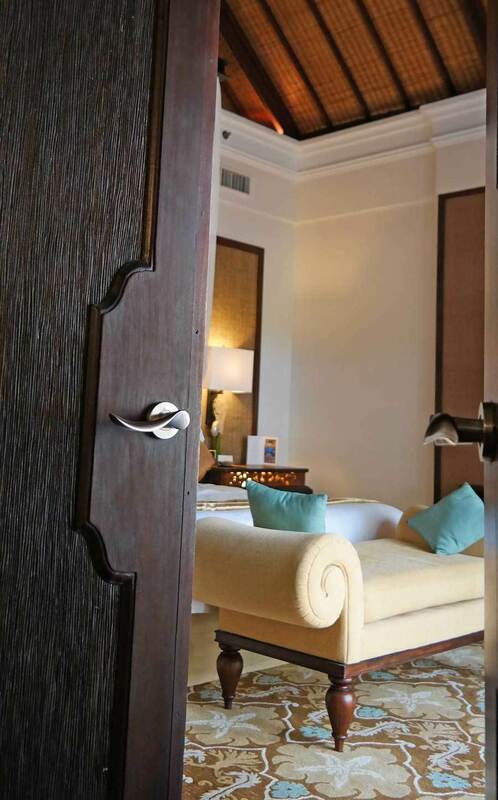 There is a sense of serenity at St. Regis, and the resort is designed in a way that you have privacy in your room or villa, yet you have easy access to the public areas. Our anticipation grows as we are taken to our private villa on the beach. On our way to our villa we go through the lush palm trees, pass the salt water lagoon, and can’t help but ooh and aah for the tropical resort. 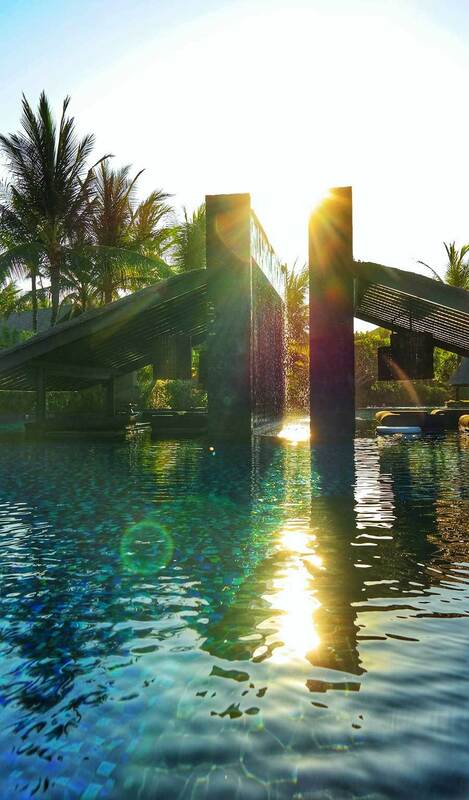 You don’t have to spend much time at St. Regis Bali to understand why it was voted as one of the Best Beach & Islands Retreats, Best Exotic Excursions AND Best Family Adventures by the Starwood Preferred Guest members this year. Each year the members vote for their favorite hotels and resorts out of over 1,200 Starwood properties. 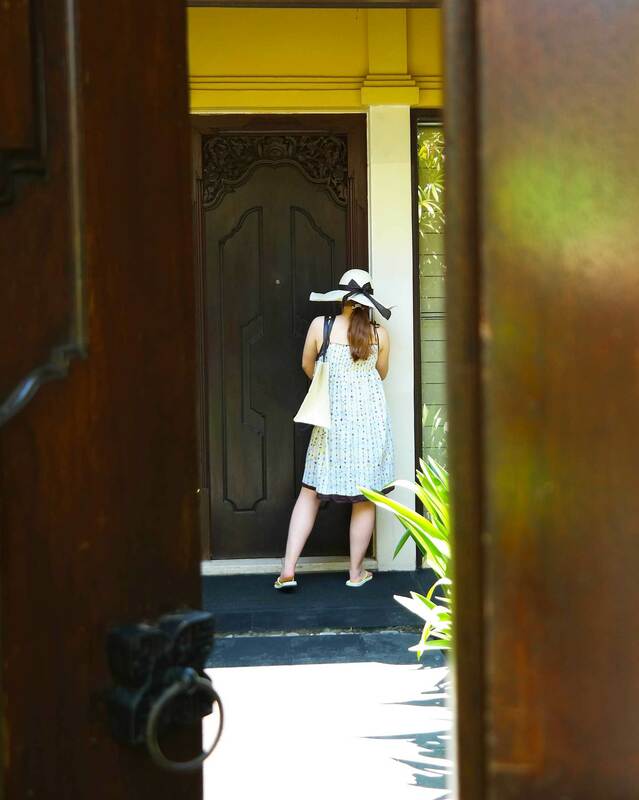 When we enter the Strand Villa, our private beach side villa, the only thought we have in our minds is “we don’t want to leave!” I am traveling with my daughter on a mother-daughter trip, and this luxurious getaway together was just what we needed to bond. The Strand Villas are located next to the beach with a direct access to the beach from the villa. At the beach there are designated beach lounge chairs waiting for you. Immediately as you go outside, your villa butler will bring you cold refreshing towel, water and will take your drink order. I recommend the watermelon juices, they are refreshingly addictive! In addition to the private access to the beach, we had our own private backyard, with a pool, cabana, outdoor shower and lounge area. Since we were staying at the St. Regis only for two nights, once we saw the resort and our villa, we in fact cancelled all of our plans for the two days, and didn’t leave the resort even once during our stay. We loved the villa so much, that we even ate lunch in and ordered room service. 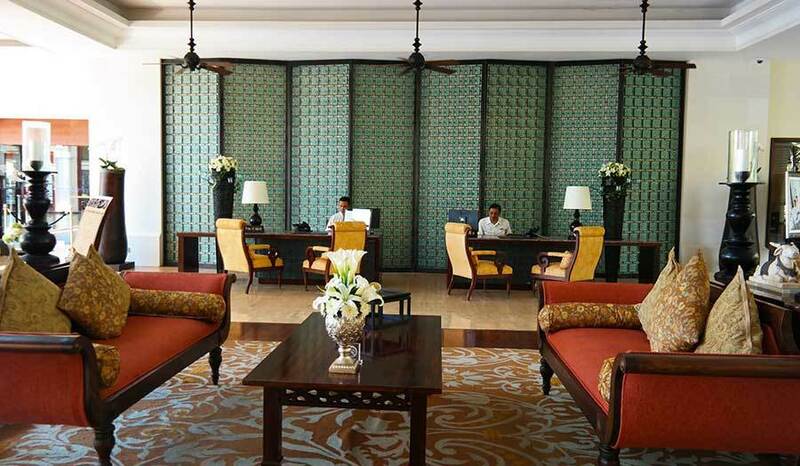 The villas come with an on-call butler, who will help you with everything from unpacking your luggage to pressing your clothes. We loved the lunch in our villa, we had already been touring Bali for a few days, and it was nice to have a relaxing break and just enjoy our villa. 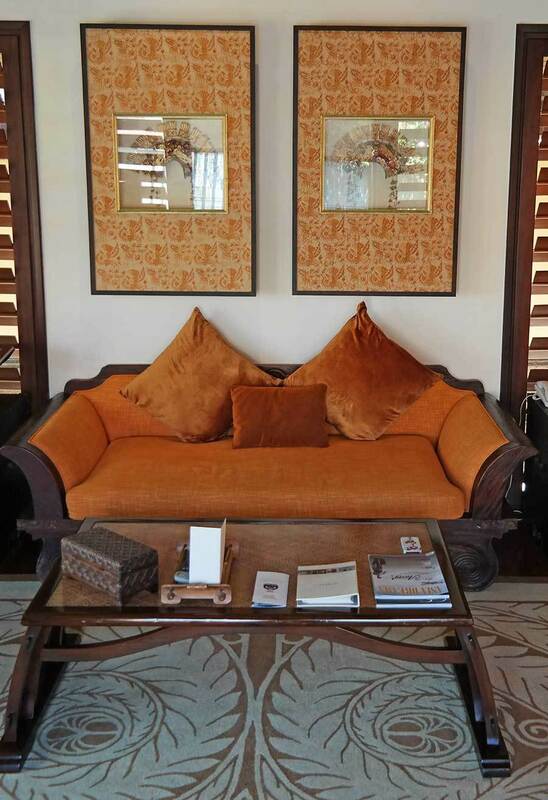 The villa is luxurious with mahogany floors, living area decorated in Balinese style, and a master suite with a gorgeous bathroom. Sleeping in the 300-thread-count fine Egyptian Ploh sheets is a bliss, and taking a bath in the generously sized (for two) bathtub is an indulge. The Strand Villa would be perfect for a honeymoon, baby moon, a romantic getaway, or even traveling with a baby or a toddler. 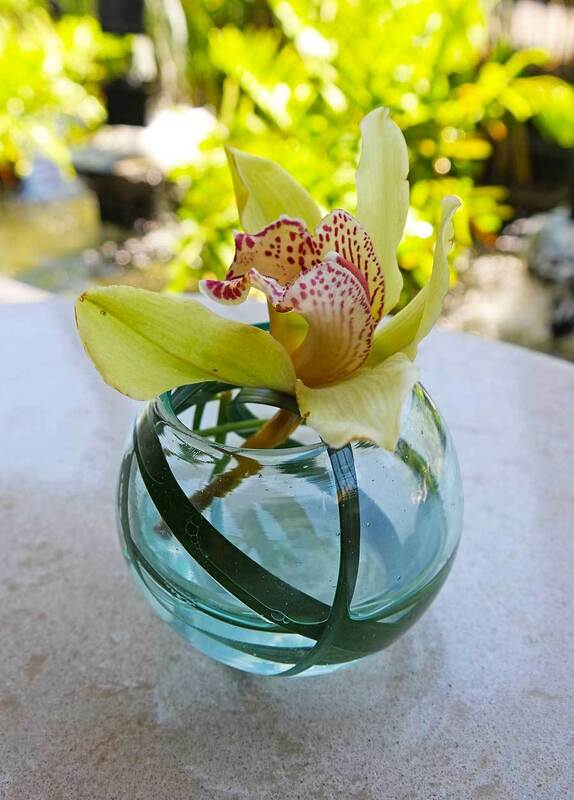 One of the things I loved about St. Regis Bali is that the property never lets you forget you are in Bali. The Balinese culture is part of the experience as a fire dance show on the sunset and as Balinese musicians play music in the lobby as guests are going for the breakfast on the morning. 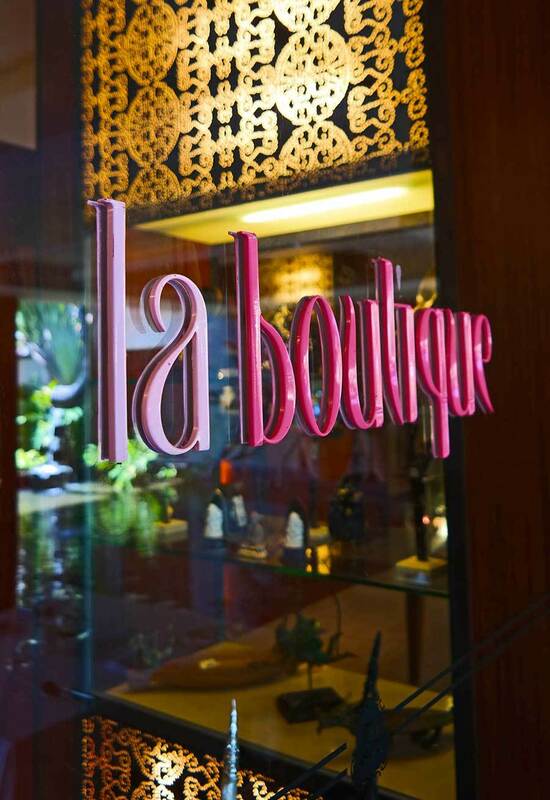 The resort is decorated in Balinese flair, and you can see art and sculptures around the property. 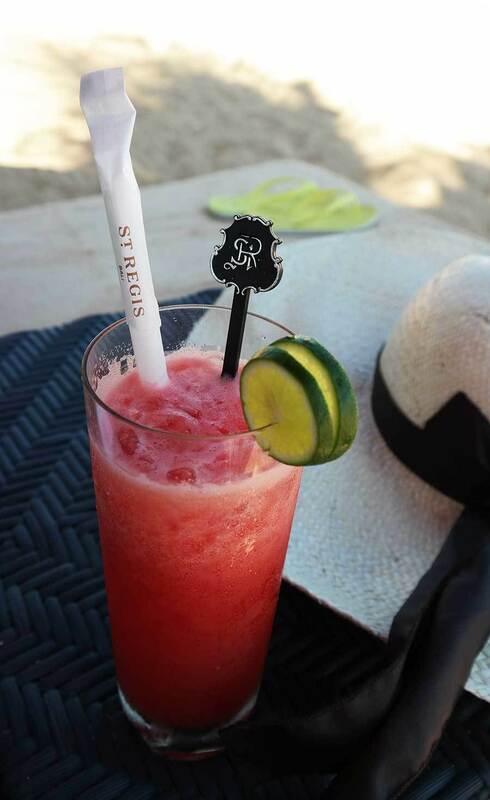 St. Regis shows that luxury is in small details executed perfectly. 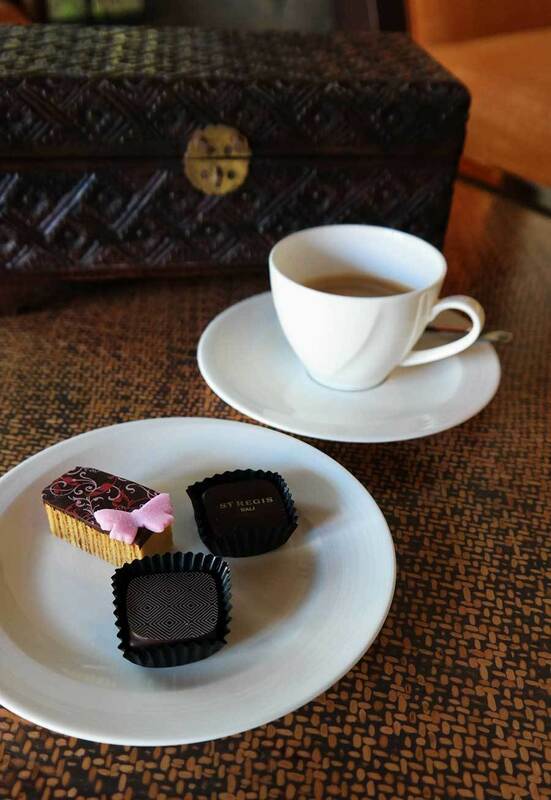 Whether it’s in the chocolates and the perfectly brewed coffee on the afternoon, or the flower arrangements around the resort, there is beauty in the small details. 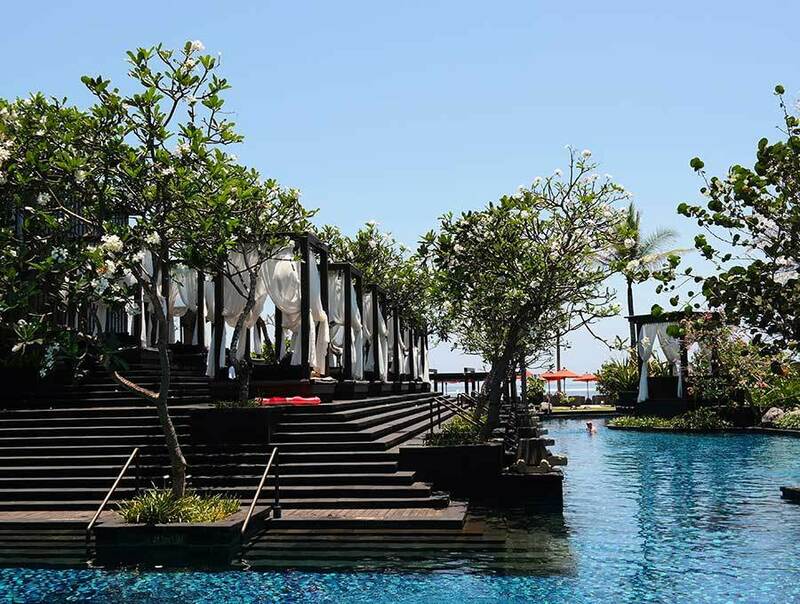 St. Regis Bali is the perfect exotic romantic vacation spot. 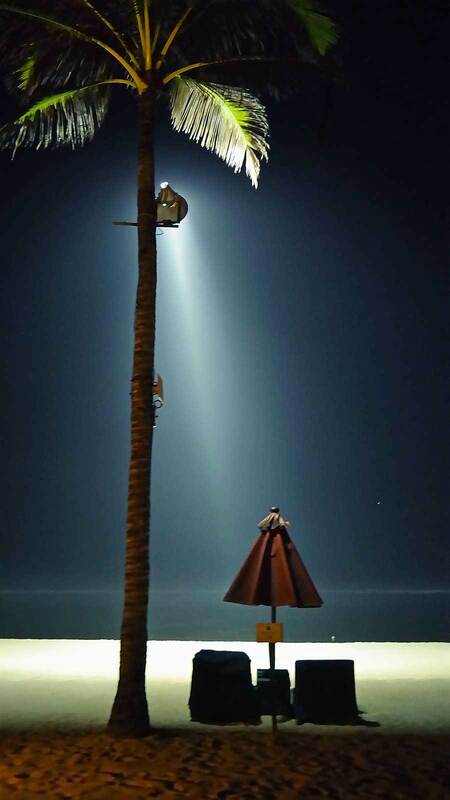 After sunset the salt water lagoons are lighted, and the beach lamps are turned on. 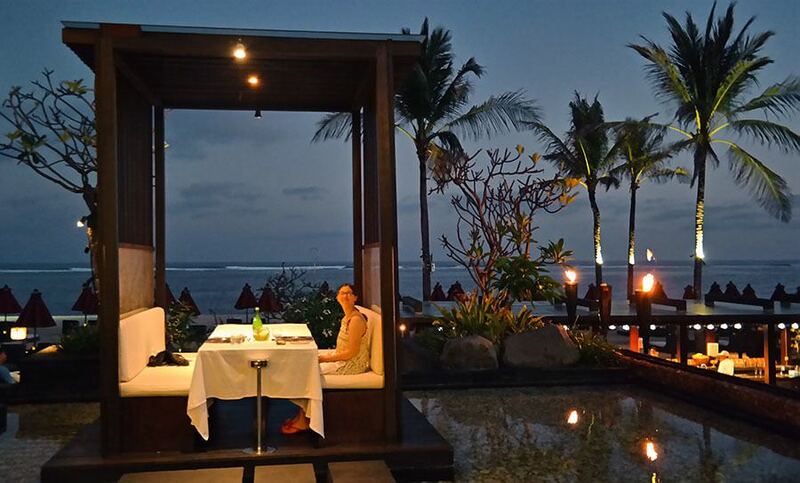 The dining on the beach awaits you, or just a romantic walk on the beach after ordering in in your private villa. 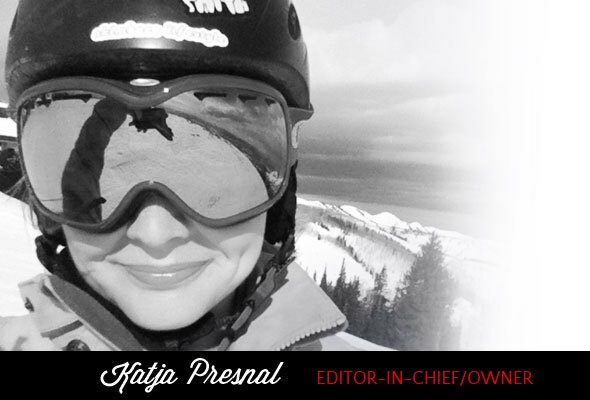 I enjoyed the luxury of St. Regis with my daughter, but I admit, there were several times I was hoping to come back with my husband for a romantic getaway just him and I. But I admit – Gabriella and me had fun swimming in the private pool after the sun was set and the darkness set in the villa backyard. The day at St. Regis starts with a breakfast at Boneka. 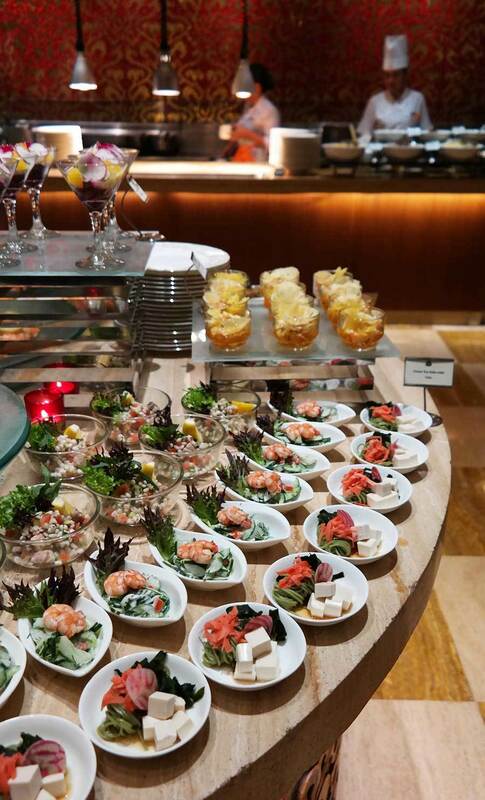 The breakfast buffet offers you both Asian and Western breakfast favorites, and Boneka has an imaginative a la carte menu on the top of the buffet. My favorite was the lobster bisque omelet, and the croissant French toast was Gabriella’s favorite. 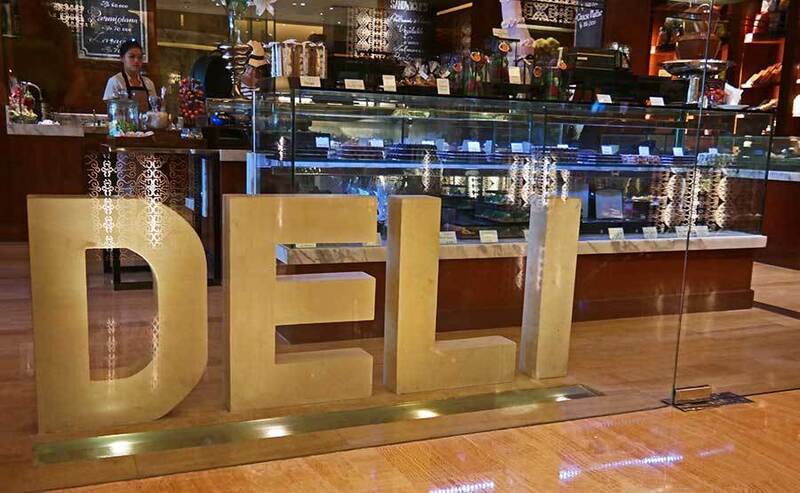 For the beach side picnics or pool side snacks, the Deli at St. Regis offered everything from lavish birthday cakes to imported cheese and wine to sushi and delicate chocolates. If you stay in Bali for longer, you must eat at the seafood places on the Jimbaran beach and at Ku De Ta and watch the sunset. However, for quick getaways like we had at St. Regis for two nights, we chose to eat at the property on both nights, and I don’t regret it. 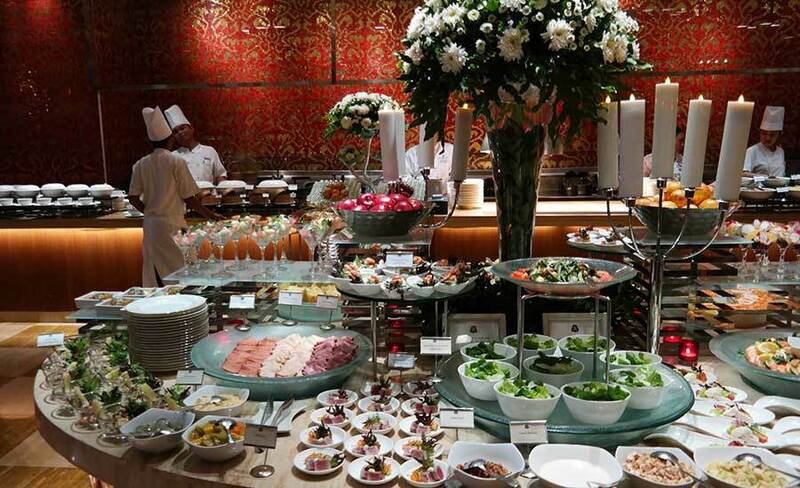 The buffet at the Boneka looked amazing, but we only ate breakfast there. 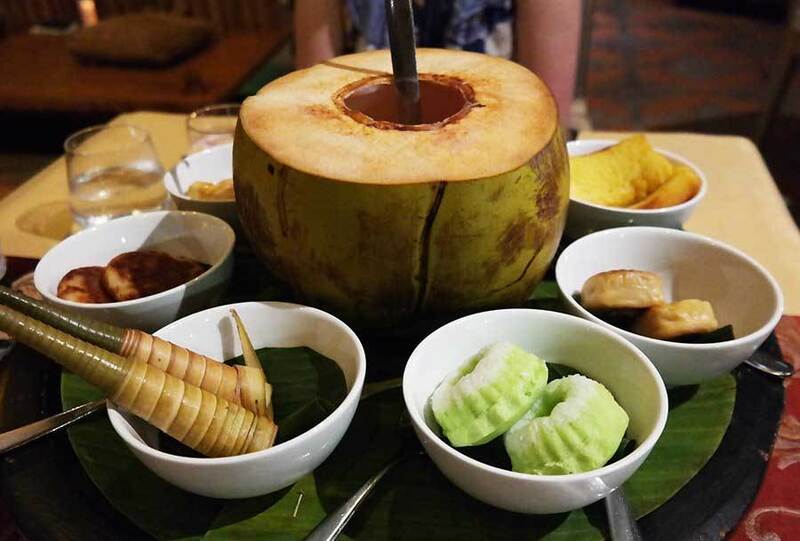 We ate at the Dulang on our first night and I highly recommend it for the experience. 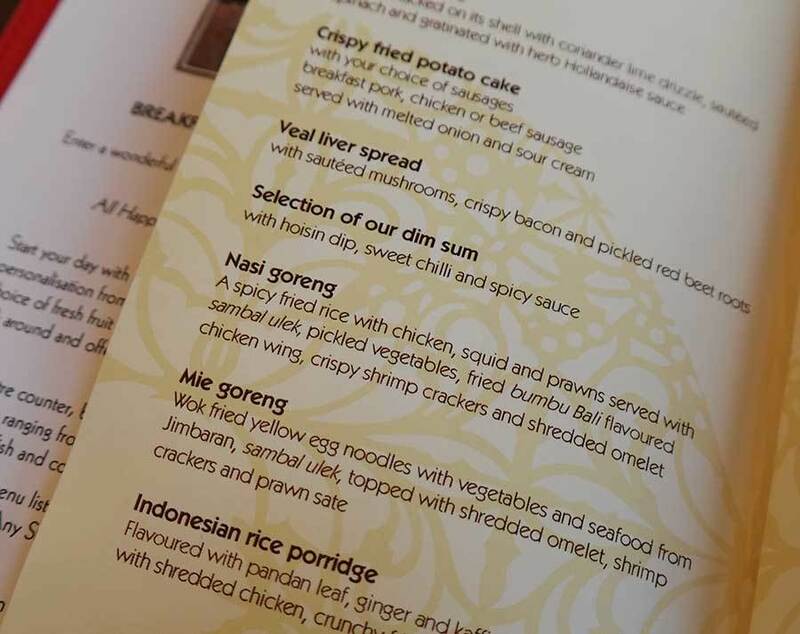 It’s a set tasting menu with several Indonesian (and Balinese) dishes, and the atmosphere is incredible in a gazebo of only a handful of tables. We couldn’t believe the amount of food that was carried to our table. The dinner starts with the traditional Balinese drink jamu, made from turmeric and ginger, which are two of the most potent antioxidant and anticancer herbs and jamu is a true health bomb. It wasn’t really my favorite, but I am not a fan of any ginger drinks. 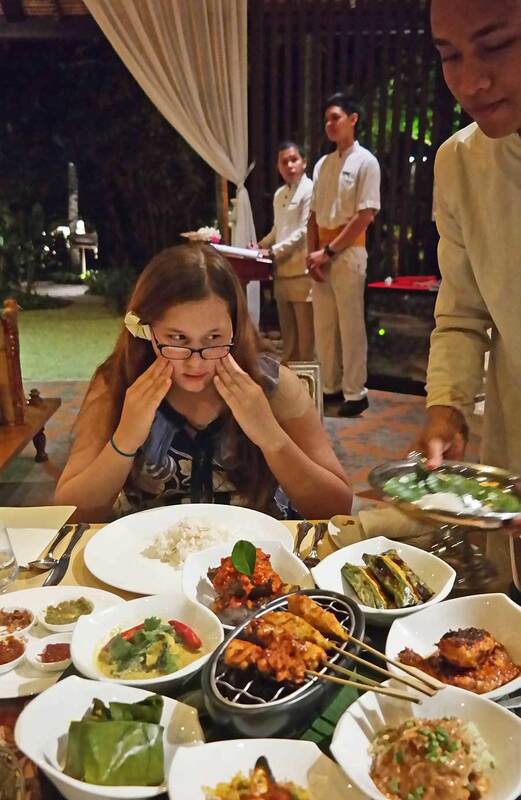 The dinner menu included 8 different main courses and it was a real Indonesian feast. A word of a warning though, the sambal was pretty spicy, so eat carefully! Sambal is an Indonesian sauce made from a variety of chili peppers and shrimp paste, fish sauce, spices, and rice vinegar. The dessert was served with coconut water and kopi luwak, you might know it as civet coffee. The Asian palm civet first carefully selects only the best coffee beans and eats the peel of the beans, and the beans stay as whole and are perfectly fermented – until they come out! 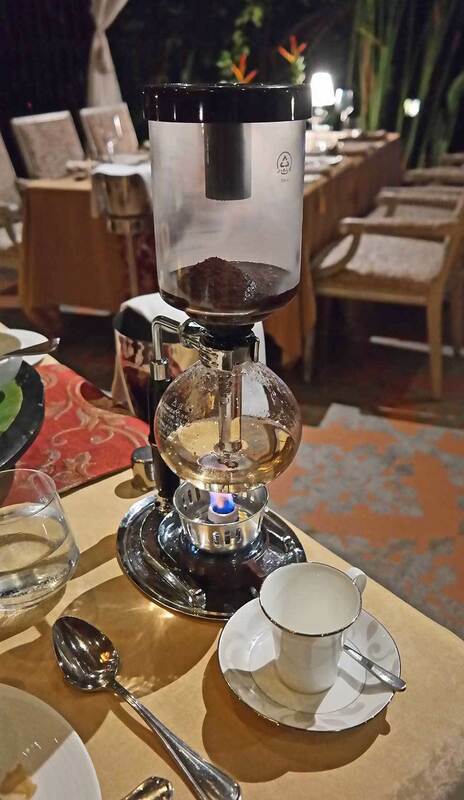 Yes, the coffee is made with beans that have gone through civet’s digestive system and then are collected, cleaned, then roasted and ground just like any other coffee. 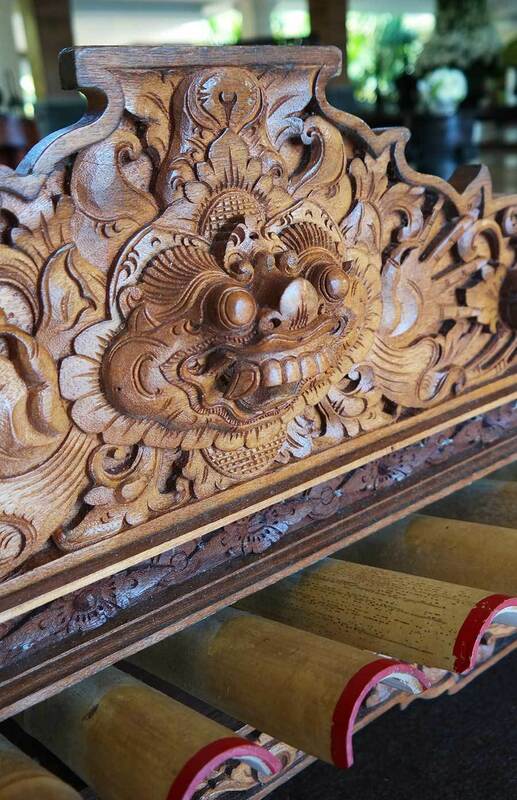 The kopi luwak as the Balinese locals call it, is the world’s most expensive coffee. The taste is smooth, and I can understand why coffee lovers like it. On our last night we ate at the Kayuputi restaurant in a private cabana over-looking the sea. 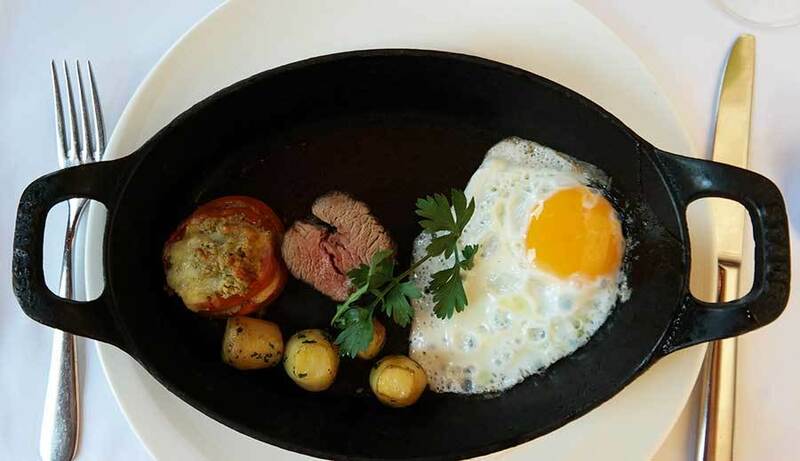 The menu is more international with imported ingredients. We ate tortellini and salmon, and they were both excellent, and the atmosphere on the beach was breath taking. 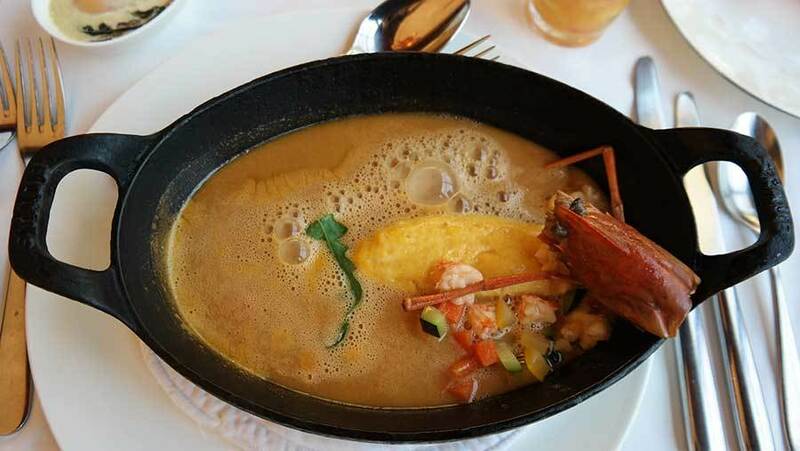 I would recommend Kayuputi for a romantic beach side (more Western style) dinner, but dining at Dulang and tasting the more exotic dishes is more unique experience. 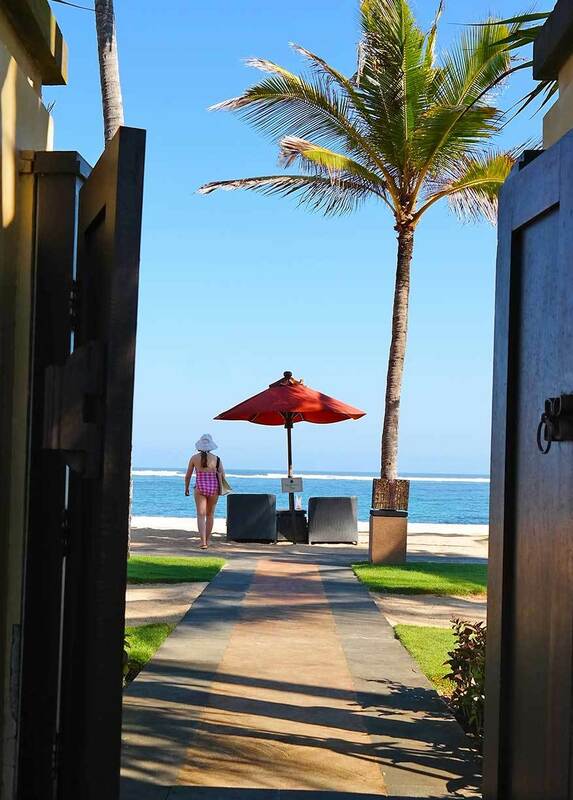 There is so much to see and do in Bali, but if you stay at St. Regis, make sure you will leave unscheduled days just for enjoying the resort and the private beach. I have stayed in other properties in Bali, and the beach at the St. Regis was my favorite, it was like having your own private beach. 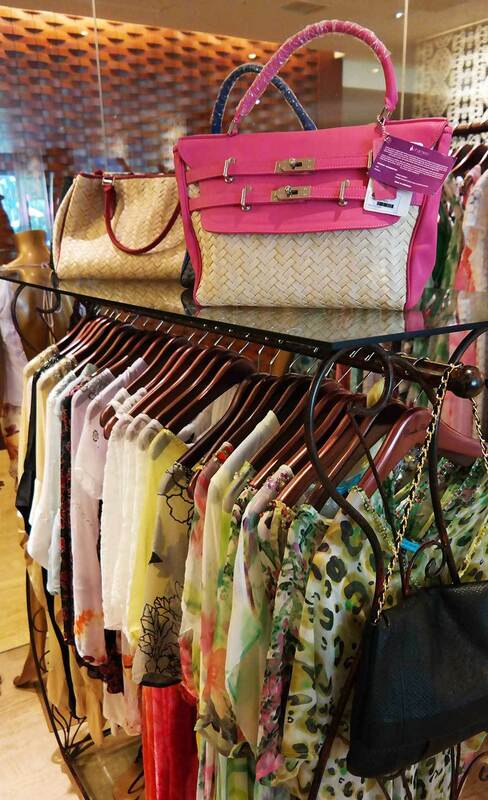 The resort has it’s own spa, and boutique for shopping. 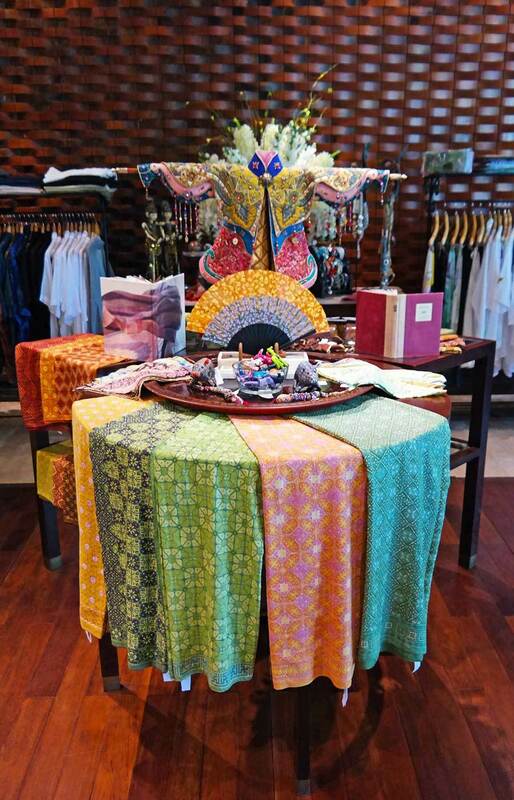 You could even get your dinner attire and souvenirs from the shop at the resort. This is just a glimpse what St. Regis is about. 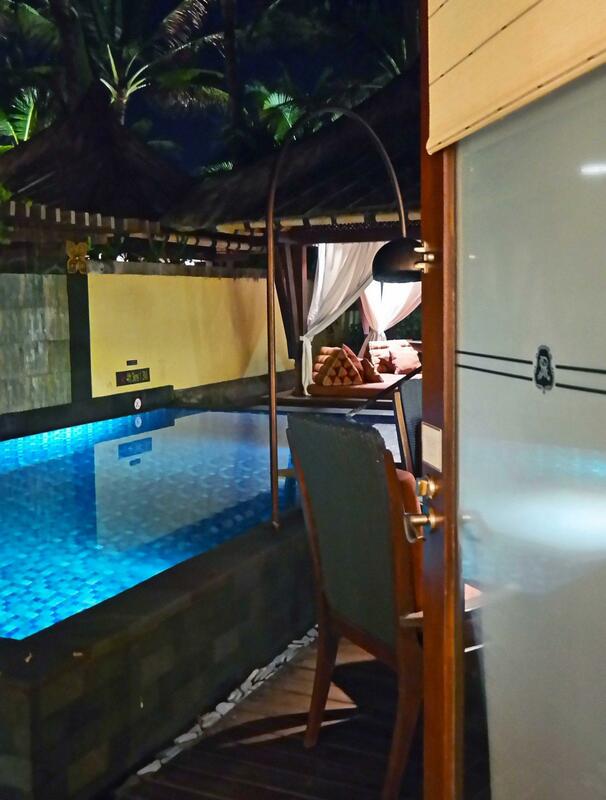 In addition they have an extensive children’s program, luxury spa, arrange adventure excursions, and their concierges are extremely helpful to guide you for your dream vacation in Bali and will help you with restaurant recommendations and reservations, booking excursions and giving you ideas how to make your vacation the one you will remember forever. 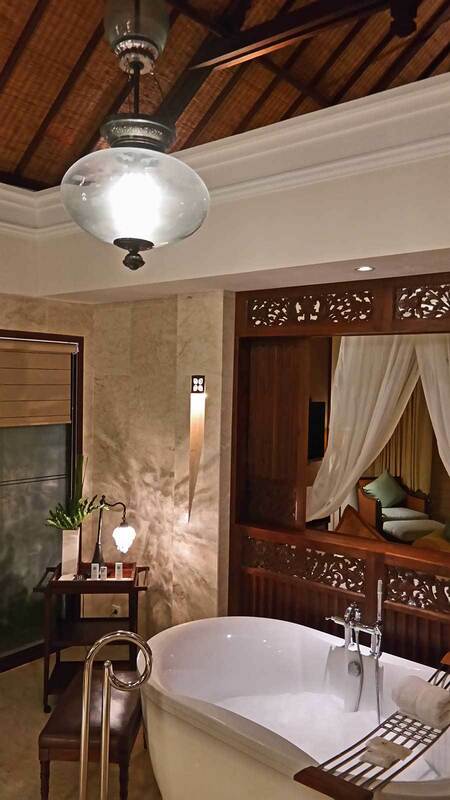 Now is actually a good time to book a stay at The St. Regis Bali, Starwood Preferred Guest prices start for rooms at $353 and the Strand Villa where we stayed starts at $1,218 per night. 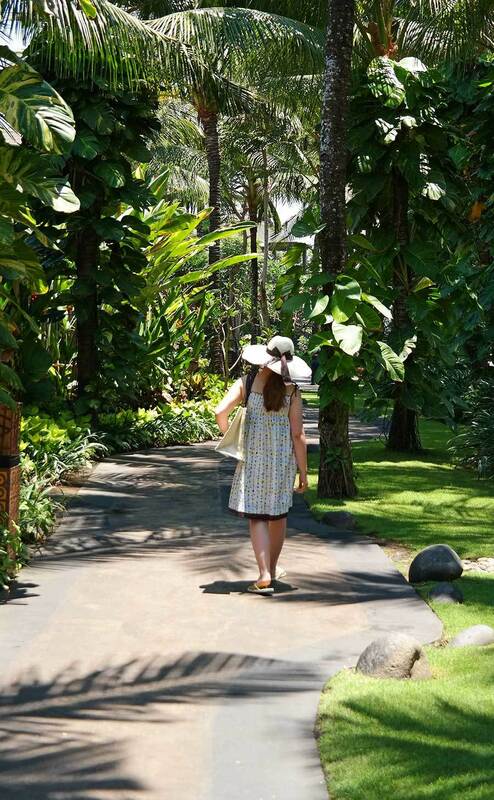 Skimbaco-reader Katy Paterson saw my Instagram photos from St. Regis Bali and immediately booked her family a getaway at the resort. You can follow Katy’s travels on her Instagram account Chamorro_chica and find out how much Katy loved her visit to St. Regis. Never had an honeymoon and October 3rd we will be celebrating our 29th anniversary. We met and married all in a 3 month time frame, have raised 2 children, traveled with work due to the military life, and have finally retired but still can’t afford to do a renewal if vows nor the honeymoon. At our 25th anniversary we had planned to renew and hubby got sick and actually had to be revived twice. Cancelled everything and never had another thought to it. Made me realize that life was just too precious to not enjoy every moment with your partner, friend, and love of my life. Life took over and here we are today. Wow, looks amazing! I have my first ever trip to Bali coming up – which is very unusual for someone from Western Australia, Bali is the closest place to fly to (even closer than other cities in Australia) and I’m one of the few Perth people I know who’s never been. 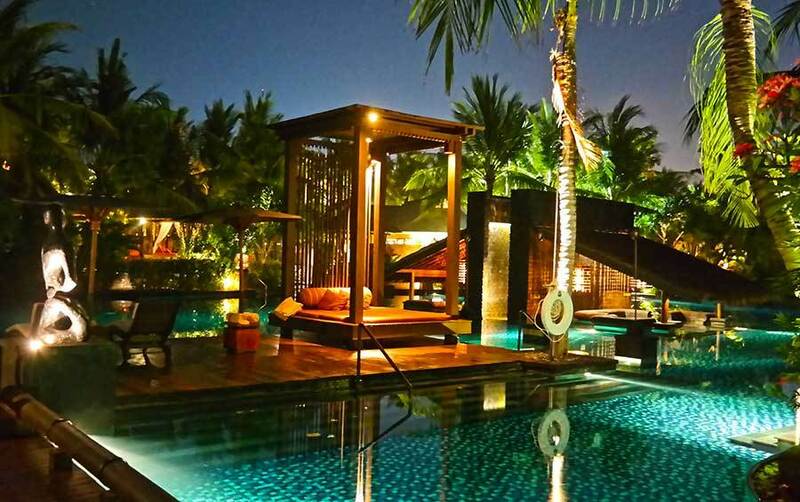 I loved Bali and St Regis just looks amazing – I think I might need to go there too when next time in Bali. And all that food looks gorgeous too!